Marshall M. Fredericks Sculpture Museum | Sketch for "The Expanding Universe"
Sketch for "The Expanding Universe"
The monumental central figure suggests a superhuman mythological being. Seated upon a ten-foot sphere, covered in a pattern of bright-star constellations, the figure holds two planets that he is sending off into space. The dynamic spiral orbit-form swirling around the sphere represents the speed and perpetual motion of space. Play of the water from numerous star-shaped sprays increases the feeling of movement. The full-scale casting of this sculpture is located in the South Court of the United States State Department Building in Washington, D.C. 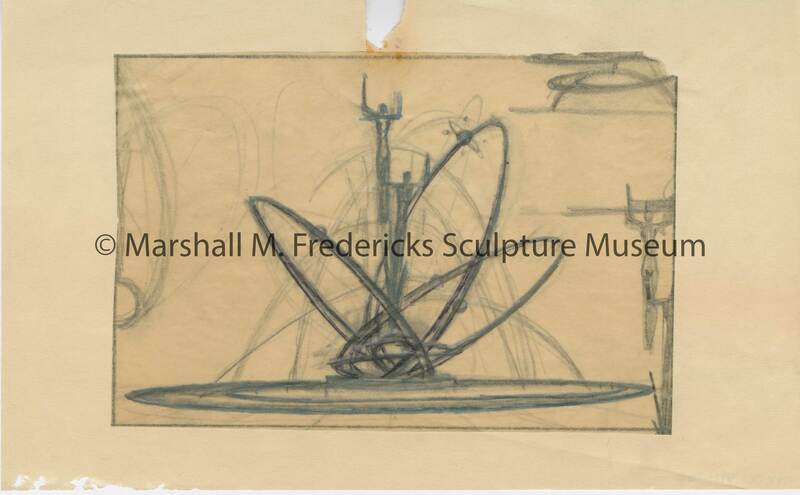 The fountain is also known as: "Man and the Expanding Universe"
Fredericks, Marshall M., 1908-1998, “Sketch for "The Expanding Universe",” Marshall M. Fredericks Sculpture Museum, accessed April 22, 2019, http://omeka.svsu.edu/items/show/6626.